Based on Lynda La Plante’s 6-part Thames Television series from the 1980s, Steve McQueen and Gillian Flynn (author of Gone Girl) have transplanted the story of four women who lose their husbands in a botched robbery into contemporary Chicago. The women have little in common, save a substantial debt left behind by their husbands and these circumstances lead to their joining together to erase the debt and move on with their lives. This core story is overlaid with a local political tug of war, in the form of the dynastic Irish-American Mulligan family (Robert Duvall and Colin Farrell) and challenger Jamal Manning (Brian Tyree Henry), with his brutal henchman Jatemme Manning (brilliantly portrayed by Daniel Kaluuya). 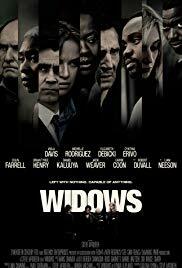 The ensemble cast is wonderful and (as an Australian) I loved seeing Jackie Weaver and increasingly impressive Elizabeth Debicki as the Russian mother and daughter, but Viola Davis is an absolute standout. Her beautiful, expressive portrayal of a wife at once mourning and angry at the situation she’s left in lights up the screen and is the emotional centre that holds all the threads together. The balance between the personal and political stories are wonderfully handled, carefully exposed and interwoven, making this so much more than another heist movie. It leads to a climax that I saw coming but still thoroughly enjoyed. Easily one of my movies of the year.